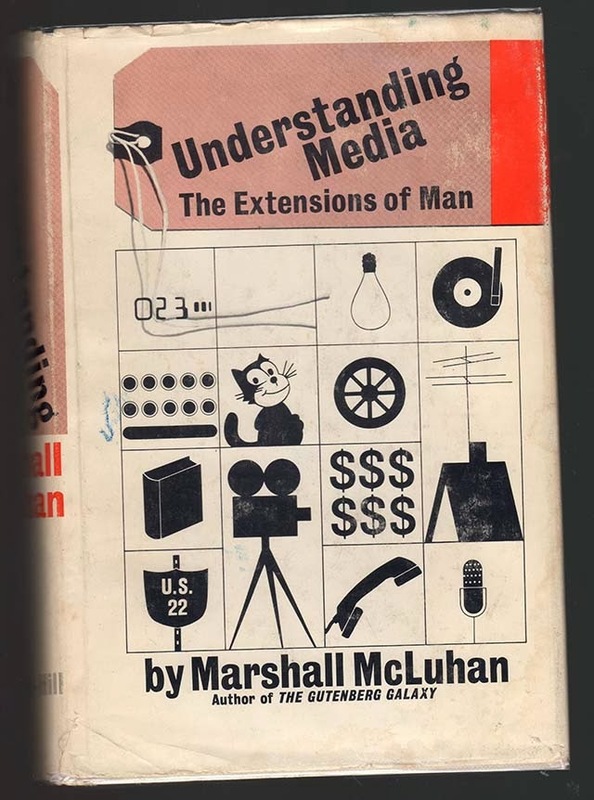 Forthcoming in Journal of Visual Culture, special issue "Marshall McLuhan's Understanding Media: The Extensions of Man @ 50" (Spring 2014). Did Marshall McLuhan “miss” computers? In his major work, Understanding Media: The Extensions of Man (1964) the word “computer” appears 21 times in the book, and a few of those references are to “computer age.” However, despite these references, his awareness of computers did not have significant effect on his thinking. The book contains two dozens chapters each devoted to a particular medium—which for McLuhan range from writing and roads to cars and television. (The last chapter “Automation” addresses the role of computers for industrial control, but not its other roles). The reasons for this omission are not hard to understand. McLuhan’s theories were focused on the media that were widely employed by regular people in human history. In 1964, the popular media for representation and communication did not yet include computers. Although by the end of the 1960s computer systems for design, drawing, animation, word processing were also developed (along with the first compute network that eventually became the Internet), these systems were only used by small communities of scientists and professionals. Only after the introduction of a PC in 1981, these inventions started to be disseminated to the masses. As a result, software has emerged as the main new media form of out time. (I say “software” rather than “digital computers” because the latter are used to do everything in our society, and often their use does not involve software visible to the ordinary users – like the systems inside a car.) Outside of certain cultural areas such as crafts and fine art, software has replaced a diverse array of physical, mechanical, and electronic technologies used before the twenty-first century to create, store, distribute and access cultural artifacts, and communicate with other people. When you write an article in Word, you are using software. When you are composing a blog post in Blogger or WordPress, you are using software. When you tweet, post messages on Facebook, search through billions of videos on YouTube, or read texts on Scribd, you are using software (specifically, its category referred to as “web applications” or “webware”—software which is accessed via web browsers and which resides on the servers). McLuhan’s theories covered the key “new media” of his time – television, newspapers and magazines with color photos, advertising, and cinema. Just as these mediums, software medium took decades to develop and mature to the point where it dominates our cultural landscape. How does the use of professional media authoring applications influences contemporary visual imagination? How does the software offered by social media services such as Instagram shapes the images people capture and share? How do particular algorithms used by Facebook to decide what updates from our friends to show in our News Feed shape how we understand the world? More generally, what does it mean to live in “software society”? In 2002, I was in Cologne, Germany, and I went into the best bookstore in the city devoted to humanities and arts titles. Its new media section contained hundreds of titles. However, not a single book was devoted to the key driver of the “computer age”: software. I started going through indexes of book after book: None of them had the word “software” either. How was that possible? Today, thanks to efforts of my colleagues in the new academic field of “software studies,” the situation is gradually improving. However, when I looked at indexes of works of key media theorists of our time published in the last year, I still did not find entry for “software.” Software as a theoretical category is still invisible to most academics, artists, and cultural professionals interested in IT and its cultural and social effects. Software is the interface to our imagination and the world—a universal language through which the world speaks, and a universal engine on which the world runs. Another term that we can use in thinking about software is that of a dimension (think of three dimensions that we use to define space). We can say that at the end of the twentieth century humans have added a fundamentally new dimension to everything that counts as “culture — that of software. However, the development and current hegemony of software does not simply perfectly illustrate the points McLuhan made 50 years ago. It also challenges these ideas. Here is how. This paradigm had far-reaching consequences for how software medium functions today. Once computers and programming were democratized enough, some of the most creative people of our time started to focus on creating these new structures and techniques rather than using the existing ones to make “content.” During the 2000, extending the computer metamedium by writing new software, plugins, programming libraries and other tools became the new cutting-edge type of cultural activity. For example, GitHub, a popular platform for sharing and developing open source tools, houses hundreds of thousands of software projects. Making new software tools is central for the fields of digital humanities and software art. And certainly, the key “media companies” of our time such as Google, Facebook, or Instagram do not create content. Instead they constantly refine and expand their software tools used by hundreds of millions of people to make content and to communicate.